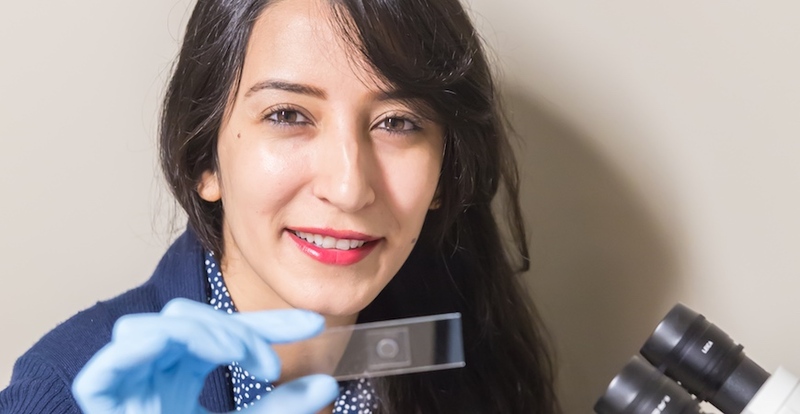 But what fifth-year doctoral student Sheida Riahinasab and physics Professor Linda Hirst actually discovered is a simple method for producing hollow, microscopic structures — a patent-pending process that may lead to tiny sensors, batteries and medicine-delivery systems. The work is detailed in a paper in Nature Communications, available now. Most of us have heard of liquid crystals. They’re the LC in LCD — the technology behind most TVs, monitors and digital displays. But many of us don’t know why liquid crystals are useful to materials experts like Riahinasab and Hirst. As the name suggests, LCs can behave as either liquid or crystal under different conditions — conditions that scientists can easily modulate. At higher temperatures, LCs behave like liquids. The molecules flow like water and dissolve nanoparticles in much the same way H2O dissolves salt. At lower temperatures, they behave like crystals — molecules arranged in 3D grids that form a larger, rigid structure. But what makes LCs unique is their nematic phase, a state in between liquid and crystal. The molecules are free to flow like a liquid, but exhibit order and alignment like a crystal. And nematic LCs are also bad solvents, a property that proved useful for the researchers. Riahinasab and Hirst realized they could use these properties of LCs to create hollow microstructures from nanoparticle building blocks. They dissolved nanoparticles in LCs then cooled the solution, making it increasingly nematic and bad at dissolving nanoparticles. The nanoparticles clustered as they were forced from the nematic region into the few remaining pockets of good solvent. After producing these highly-concentrated nanoparticle islands, the cooling continued, causing the nanoparticles to self-assemble into hollow foams, tubes and spheres. But these microstructures aren’t formed at the same time. Instead, scientists choose the shape and size of the microstructures by controlling the speed at which the LC cools — a process that takes a second or less and can be done at near room temperature. But once these microstructures form, what’s to prevent them from disassembling as soon as they reencounter liquid? That’s where chemistry Professor Benjamin Stokes comes in. The Stokes lab designed special molecules that sit on the surface of the nanoparticles and act like molecular clasps, fastening nanoparticles together and ensuring that hollow microstructures retain their shape. This way, the hollow structures can be filled with useful molecular cargo — perhaps a cancer-fighting drug — and safely delivered to its destination. These surface molecules have another useful property: They’re designed to unclasp under specific conditions. Zap the microstructure with laser light of a particular color or heat it above a certain temperature, and the structure falls apart and releases its contents. Hirst, who is part of the Health Sciences Research Institute, explained that if nanofoams carrying cancer-killing drugs were injected into a patient, they would disperse throughout the patient’s body. But doctors could focus heat on a tumor and ensure the nanofoams only released their cargo into diseased tissue.